Obituary – Beasley, Raymond Eli « Perry High School Alumni Association, Inc.
﻿F.T.A. 51-53, F.T.A. Vice-President 52-53, Band 49-53, Junior Play 57-52, Perry-scope Staff 52-53, Wrestling 49-53. Raymond Eli Beasley, 68, of Edmond was born October 18, 1935 in Perry, OK to Rosco and Bessie Beasley. Mr. Beasley passed away September 27, 2004 in Oklahoma City. 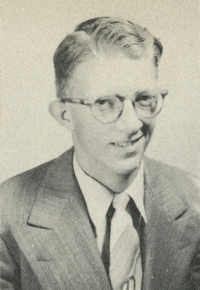 He was Professor Emeritus of the University of Central Oklahoma and served as chairman of the Mathematics Department from 1971 to 1979. He retired from the Math Department in 1999. Survivors include his wife, Carolyn Beasley of Edmond; daughter, Traci Beasley Kimball of Grapevine, TX; son, Ryan Beasley of Lawrence, KS; sister, Doris Mogil of Oceanside, CA, and three grandchildren. A memorial service is scheduled for 3:00 P.M. Friday, October 1, 2004 at Baggerley Funeral Home, Edmond. Private interment. In lieu of flowers, the family requests donations can be made to UCO Foundation, 100 N. University, Evans Hall 101, Edmond, OK 73034.